You wish to explore several cities during your vacation in the Netherlands? Here we provide the best opportunity to get the most out of it: The Holland Pass! Discover Holland's amazing landscapes and its unique cultural wealth. The Holland Pass allows you to discover the best culture, gastronomy and leisure activities in Amsterdam and in the country without any waiting in line! Holland was the home of several famous artists, such as Van Gogh. Besides an interesting art and cultural heritage, the Dutch daily life and its nature need to be explored, too. Come and discover Holland's history and Dutch daily life in comfort. 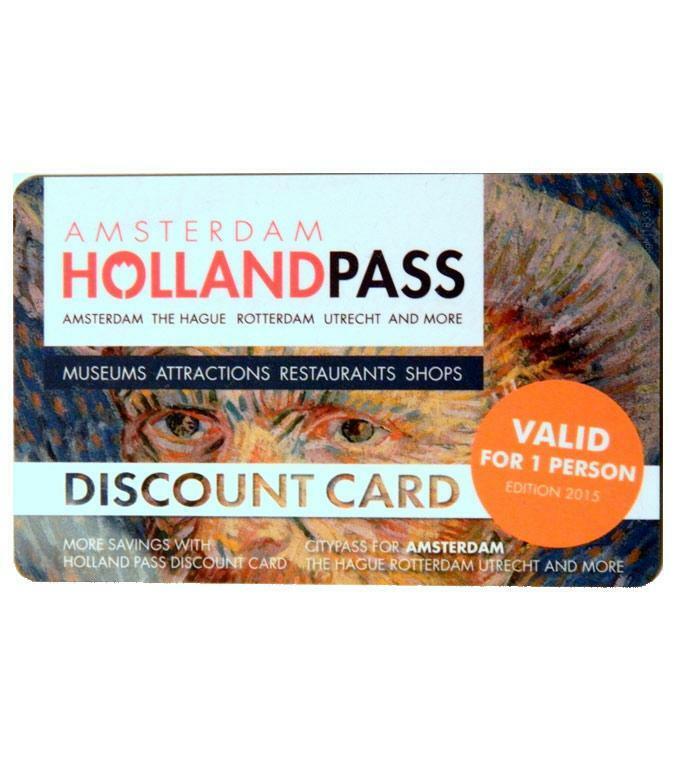 Being the owner of the Holland Pass, you are allowed to enter many museums, join guided tours, use transport for free, have discounts and special offers in restaurants and major shops in MORE THAN ONE CITY! The Holland Pass includes 'skip the line' admission for several museums depending on the type of card purchased, as well as discounts in more than 150 places of interest, all over the country! You will get very interesting discounts of tours around Amsterdam's surroundings. You will receive together with your card a free ticket for a City Sightseeing Hop on, Hop off tour or a Canal Cruise in Amsterdam. In exchange for one silver ticket you wll get a public transportation pass. Travel as you like at the best price! Take advantage of lunch and dinner discounts at the best restaurants and bars in all the cities. Enjoy discounts at the country´s major stores. Choose either 3, 4 or 6 tickets and enter the selected museums and attractions in Holland for free. The tickets also allows you discounts in shops, restaurants and leisure and cultural centres. Holland Pass is valid per person. Every version has 1, 2 or 3 Gold tickets that is valid at museums and attractions, including Rijksmuseum. One of the Gold tickets is valid for free entrance to the Rijksmuseum. Other Gold tickets in the package do not offer free entry at the Rijksmuseum. Per version, you can only visit the Rijksmuseum once. ONLY Rijksmuseum ticket is valid. The admission fees are already paid...you only need to enjoy the experience. Your Holland Pass is valid for one month after first use/purchase.